I don’t want to own my music! Steve Jobs said last year that he did not see that the successful iTunes business model of selling individual music tracks would be threathened by subscription models where you pay a fixed fee to access all the music you want. I am convinced that Steve Jobs now realizes that he was wrong (and probably work hard to catch up). The reason people like iTunes is that it is very easy to use and the pricing seems very moderate compared to what people were accustomed to: buying CDs with lots of unwanted tracks. But that is just because people have not yet tested the upcoming alternatives such as Spotify and other new services. They offer unlimited listening to music without downloading files, and they are faster and just as easy to use as iTunes. Spotify, an upcoming topnotch Swedish streaming music service. It will be free to use with ads, a premium version without ads will also be available. Downloading media files will soon be a thing of the past! I am quite certain that in a few years time we will laugh at this period of time when we downloaded all these media files and struggled with copy-protection and backups and not being able to play them on certain devices etc. I don’t want to own files or CDs, I want to listen to my favorite music and find new music easily. I don’t want to fill up my hard drive with Gigabytes of media files that can vanish in a hard drive crash. I want to listen to my music library on multiple computers and on my iPhone mobile. I want to be able to share my music easily with friends and family. Ubiquitous wireless internet. We are almost there now in many places. The music industry realizing that this is also a way of solving the piracy problem. If you don’t need to download any files to listen to music, why bother with pirated files? So the only reason for downloading music will be when you want to play it in locations without internet, such as when jogging in the forest etc. But that is also a temporary problem as new wireless fixed-rate broadband services will soon cover entire countries. Please give me a call when the entire world will be covered by “new wireless fixed-rate broadband services”, and that the internet bandwidth available will be large enough so that everyone will enjoy media via streaming. The ad-supported free-stream idea is okay. My issue is being unable to download actual mp3 and/or flac files for transfer/burn. I would pay for that. 1: CD’s are designed for greater dynamic ranges than Vinyl. However, loads of recordings are mastered to death with compression and limiting these days. Such destruction of good music must end. Check out http://turnmeup.org/ for more information on this. But it’s certainly not the CD-format that’s suppressing the dynamics. 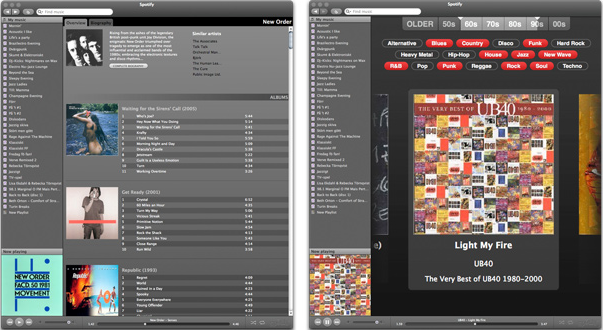 Although I enjoy services like spotify, last.fm and similar, they lack the technical quality of a cd – for now. As our internet-speeds increase, this might even out. But then, of course, maybe we’ll strive for blu-ray discs with multiple channel music? (Or maybe that’s already on the market? I don’t know, and for now, I like my cd’s). The big question is if, and subsequently, when will bandwith catch up with the data size of high quality media? Until that happens, I see a market for a physical product like the CD. (Did i hear anyone propose spotify with flac-compression?) We already have loads of web-tv services exceeding the bandwidth needed by a flac-stream, so I can’t see why it shouldn’t happen anytime soon. 2: I don’t see why the less known bands would suffer from this. Are these bands any easier to get hold of in you average record store today? But still. This is a difficult matter. But already I see powerful possibilities in Spotify, by i.e. making it possible listening to “similar artists” and so on. Such services might actually make consumers aware of bands they’d never hear hanging around at their local record store (if that store would still exist, that is). It’s obvious that most of bands these days has to do a lot of touring to get by. But I still think getting played on spotify or whatever will generate more money than kids downloading the songs at soulseek instead. (At least that’s what I’d like to believe). An implementation with myspace with similar funding rights as those signed on labels could possibly spotify’s solution to the unsigned bands? Oh. all the thoughts. You inspired med, and I was carried away. 1. How come noone talks about quality? As I understand Spotify uses Ogg Vorbis 160Kbit, right? That’s pretty far from cd quality not to speak of vinyl with its dynamic range. Compressed audio is acually similar to compressed images and I don’t think people would like the idea of “from now on you can only view jpg:s at 640×480 pixels never being able to print a decent paper copy”. 2. How are the small artists supposed to make a living? (someone touched this matter above). People who are filesharing all work for free too? The major artists are not the issue, the small ones are. The ones not under contract with major and semi major record companies who record and promote under own label. I would very much like these 2 issues to be solved. Hey there. Personally, I feel that the whole “copy around to your devices” won’t be for long. The whole fundamental idea of having people hosting replicas of each other’s stuff feels….well not so innovative. Hey, team up with Steve Jobs and make the iphone go spotify. That way we could throw away all of our other hardware crap and consolidate into one happy product. For a while, anyhow. – Spotify, Last FM, Deezer, whatever the others are will all co -exist. They will have to join hands probably as well to bring about a more comprehensive database. For instance, don’t you think Spotify with Last.FM will be awesome? – That said, I think iTunes, and labels together have already begun the DRM free music revolution. They are all aware that there are illegal sources, and P2P and the others just makes acquiring of music so damn easy (although managing them more than storing them could be an issue). Ja, denna post är helt spot on. Cloud computing är framtiden. Google visade vägen och nu är det många aktörer som bygger denna infrastruktur. Musik, böcker, film, dokument etc. kan läggas i molnet. Detta innebär samtidigt att vi inte behöver ha sådana komplexa mobiltelefoner och datorer längre. De kan vara enkla uppkopplingsverktyg (fysiska skal) där de viktiga programmen finns i molnet och där då dessa är lätta att tex uppgradera. Problemet med allt detta är bara hur affärsmodellerna skall se ut? Det är inte tillräckligt med betalningsmodeller i form av annonser eller (månads)avgifter. Det måste komma fram bättre och fler betalningsmodeller. Well.. I think it might be way to premature to discard ordinary “pay-and-download” services for music. Speaking for myself, I still want to own to the song and thus being able to copy it around my devices including my PC and car stereo. I am a much bigger fan of the streaming alternative when it comes to movies. Are the authors paid when their songs are played or? Like a modern STIM. In fact, this is what STIM want to do – is it not? Henrik! You’re absolutely right… on track as always…cause you have a sense of what’s human!